This week on Ochocinco: The Ultimate Catch, the same final four competitors (for two weeks in row now) landed safely in Miami. I realized Chad was delivering a big show shocker when he didn’t eliminate anyone last week. However, we love it when people get sent packing! Last night on Ochocinco: The Ultimate Catch, the final four arrived to their lavish hotel suite at the Marriott in Cincinnati, Ohio. Chad needed the girls close to him as training camp had begun! He joined the girls in their room and complained of his sore muscles. The least he could have done was disrobed so that we could see exactly what he was talking about! 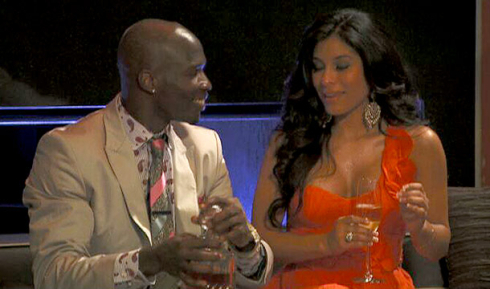 I love this show because Chad Ochocinco eliminates two girls at a time! He is down to his “Elite Eight” and I couldn’t wait to see who got the next punt home! Last night on Ochocinco: The Ultimate Catch, Chad whisked the girls away for a quick cabin vacation in Big Bear Lake, California. Let’s get ready to rummmbbbble! Last night on Ochocinco: The Ultimate Catch, Chad took both the Blue and Red Teams to the beach to play football. Everyone played except for Tara, Ericka and Laurice who all think they’re too cool for school. As expected, Tara provided the comedic commentary for the game.